Bu çalışma aylık verilerden ve ARDL yaklaşımından yararlanarak 2003 ile 2016 yılları arasında seçilmiş makroekonomik değişkenlerle hisse senedi getirileri arasındaki nedensellik ilişkisini araştırmaktadır. S&P500 ve dünya petrol fiyat endeksini dışsal kontrol değişkenleri olarak kullanarak, bu çalışmanın ampirik test sonuçları uzun dönemde hisse senedi getirilerinin temel belirleyicilerinin imalat sanayi endeksi, tüketici fiyat endeksi, cari işlemler hesabının ihracata oranı, reel efektif döviz kuru, TCMB politika faizi ile FFR farkından oluşan faiz oranları farkı, S&P500 ve dünya petrol fiyat endeksi olduğunu ortaya koymaktadır. Ampirik test sonuçları, BIST hisse senedi getirileri ile tüketici fiyat endeksi, cari işlemler hesabının ihracata oranı, reel efektif döviz kuru, S&P500 ve dünya petrol fiyat endeksi arasında istatistiksel olarak anlamlı ve pozitif, TCMB politika faizi ile FFR farkından oluşan faiz oranları farkı arasında ise istatistiksel olarak anlamlı ve negatif bir ilişki olduğunu ortaya koymaktadır. İşsizlik oranındaki değişmelerin hisse senedi getirilerine bir etkisi yoktur. This study investigates the causal relationship between selected domestic and international macroeconomic variables and the stock returns in Turkey by using ARDL methodology for the period of 2003:1-2016:12. By taking S&P500 and World Oil Price Index as exogenous control variables, the study finds that the main determinants of Turkish stock returns are the changes in industrial production index, consumer price index , current account to export ratio, real effective exchange rate, Standard & Poor's 500 Index, World Oil Price Index and the interest difference between Turkish Central Bank policy rate and the Federal Funds Rate of the USA in the long-run. The signs of industrial production index , consumer price index, current account to export ratio, real effective exchange rate, S&P500 and World Oil Price Index are statistically significant and positive and the sign of the interest difference between Turkish policy rate and the FFR is negative. The test results also show that Turkish unemployment rate does not have any effect on Turkish stock returns. Abdalla, A. and Murinde, V. (1997) Exchange rate and stock price interactions in emerging financial markets: evidence on India, Korea, Pakistan and the Philippines, Applied Financial Economics, Vol. 7, Issue 1, pp. 25-35. Abdullah, D.A. and Hayworth, S.C. (1993) Macroeconomics of Stock Price Fluctuations, Quarterly Journal of Business and Economics, 32, pp.50-67. Abugri, B. A. (2008) Empirical relationship between macroeconomic volatility and stock returns: Evidence from Latin American markets, International Review of Financial Analysis, Volume 17, Issue 2, pp.396–410. Acikalin, S., Aktas, R., and Unal,S. (2008), Relationships Between Stock Markets And Macroeconomic Variables: An Empirical Analysis of The Istanbul Stock Exchange, Investment Management and Financial Innovations, Volume 5, Issue 1, pp. 8-16. Adom, P.K., Bekoe,W. and Akoena, S.K.K. (2012) Modelling Aggregate Domestic Electricity Demand In Ghana: An Autoregressive Distributed Lag Bounds Cointegration Approach, Energy Policy 42, pp.530–537. Apergis, NT. (1998) Stock Market Volatility and Deviations From Macroeconomic Fundamentals: Evidence From GARCH And GARCH-X Models, Kredit und Kapital, Heft 3: pp.400–412. Aydemir, O. and Demirhan, E. (2009) The Relationship Between Stock Prices And Exchange Rates Evidence From Turkey, International Research Journal of Finance and Economics, Issue 23, pp.207-215. Büyükşalvarcı, A. and Abdioğlu, H. (2010). 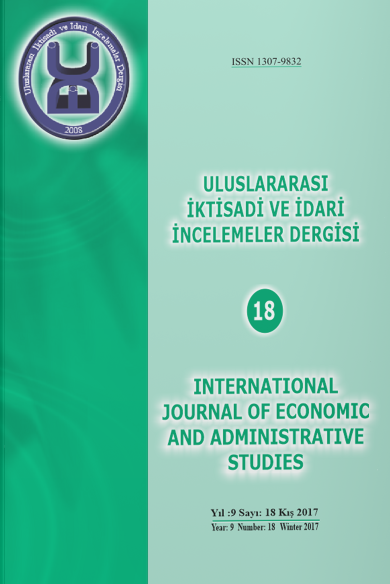 Corporate Governance, Financial Ratios and Stock Returns: An Empirical Analysis of İstanbul Stock Exchange (ISE), International Research Journal of Finance and Economics, Issue 57, pp.70-81. Brooks, C. (2014) “Introductory Econometrics for Finance”, Cambridge University Press, 3rd Edition, June 2014. Chen, N.-F., Roll, R. and Ross, S. A. (1986) Economics Forces And The Stock Market, Journal of Business, Vol.59,No.3. pp.383–403. Dhakal, D., Kandil, M. and Sharma, S.C. (1993) Causality Between The Money Supply and Share Prices: A VAR Investigation, Quarterly Journal of Business and Economics, 32, p.52-74. Duasa, J. (2007) Determinants of Malaysian Trade Balance: An ARDL Bound Testing Approach, Global Economic Review Perspectives on East Asian Economies and Industries, Volume 36, Issue 1, pp.89-102. Engle, Robert F. and Granger, C. W. J. (1987) Co-Integration and Error Correction: Representation, Estimation, and Testing, Econometrica, Vol. 55, No. 2., pp. 251-276. Fama, E. F. (1990) Stock Returns, Expected Returns, And Real Activity, The Journal of Finance, Volume 45, Isuue 4, pp. 1089–108. Gallinger, George W.(1994) Causality Tests of The Real Stock Return‐Real Activity Hypothesis, Journal of Financial Research, Vol.17,No.2, pp.271-288. Gjerde, Ø. and Sættem, F. (1999) Causal Relations Among Stock Returns And Macroeconomic Variables In A Small, Open Economy, Journal of International Financial Markets, Institutions and Money, Vol. 9, Issue 1, pp.61-74. Humpe, A. and Macmillan, P. (2009) Can Macroeconomic Variables Explain Long-Term Stock Market Movements? A Comparison of the US and Japan, Applied Financial Economics, 2009, Vol. 19, Issue 2, pp.111-119. Kandir, S.Y. (2008) Macroeconomic Variables, Firm Characteristics and Stock Returns: Evidence from Turkey, International Research Journal of Finance and Economics, Issue 16, pp.35-45. Kwon, Chung S. and Shin, Tai S. (1999) Cointegration And Causality Between Macroeconomic Variables And Stock Market Returns, Global Finance Journal, Vol. 10, Issue 1, pp.71-81. Levine, R. and Zervos S. (1998) Stock Markets, Banks, and Economic Growth, The American Economic Review, Vol. 88, No. 3., pp. 537-558. Naceur, S.B., Ghazouani, S. and Omran,M. (2007) The Determinants Of Stock Market Development In The Middle‐Eastern And North African Region, Managerial Finance, Vol. 33 Issue: 7, pp.477-489. Nasseh, A.and Strauss, J. (2000) Stock Prices And Domestic And International Macroeconomic Activity: A Cointegration Approach, The Quarterly Review of Economics and Finance, Volume 40, Issue 2, pp.229–245. Ozbay, E. (2009) The Relationship Between Stock Returns And Macroeconomic Factors: Evidence From Turkey, University of Exeter, Dissertation of Master of Science, Sept. 2009. Özlen, Ş. and Ergun, U. (2012) Macroeconomic Factors and Stock Returns, International Journal of Academic Research in Business and Social Sciences, Vol. 2, No. 9, pp. 315-343. Pesaran, H. and Shin, Y. (1999) An Autoregressive Distributed Lag Modelling Approach to Cointegration Analysis, In S. Strom (eds.) Econometrics and Economic Theory in the 20th Century: The Ragnar Frisch Centennial Symposium Cambridge University Press. Pesaran, M. H., Shin, Y. and Smith, R. J. (2001) Bounds Testing Approaches to the Analysis of Level Relationships, Journal of Applied Econometrics, Vol. 16, Issue 3, pp. 289–326. Pradhan, R. P., Arvin, M. B., Samadhan, B., and Taneja, S. (2013). The Impact Of Stock Market Development On Inflation And Economic Growth Of 16 Asian Countries: A Panel VAR Approach, Applied Econometrics and International Development, Vol.13(1), pp. 203–220. Ratanapakorna, O. and Sharmab, S. C. (2007) Dynamic Analysis Between The US Stock Returns And The Macroeconomic Variables, Applied Financial Economics, Volume 17, Issue 5, pp. 369–377. Rousseau, P.L. and Wachtel, P. (2000) Equity Markets And Growth: Cross-Country Evidence On Timing And Outcomes, 1980–1995, Journal of Banking & Finance, Volume 24, Issue 12, pp.1933–195. Sahu, N. C. and Dhiman, D. H. (2011) Correlation and Causality Between Stock Market and Macro Economic Variables In India: An Empirical Study, International Proceedings of Economics Development and Research, Vol. 3, pp. 281–284. Savasa, B. and Samiloglub, F. (2010) The Impact Of Macroeconomic Variables on Stock Returns In Turkey: An ARDL Bounds Testing Approach, Afyon Kocatepe Üniversitesi, İ.İ.B.F. Dergisi, Vol.XII, No. I, pp.111-122. Schwert G. W. (1981) The Adjustment of Stock Prices to Information About Inflation, The Journal of Finance, Vol.36, Issue 1, pp. 15-29. Schwert G. W. (1990) Stock Returns and Real Activity: A Century of Evidence, The Journal of Finance, Vol. XLV, No.4, pp. 1237-1257. Shahbaz, M., Ahmed, N. and Ali, L. (2008) Stock Market Development and Economic Growth: ARDL Causality in Pakistan, International Research Journal of Finance and Economics, Issue 14, pp. 182-195. Singh, T., Mehta,S. and Varsha, M. S. (2011) Macroeconomic factors and stock returns: Evidence from Taiwan, Journal of Economics and International Finance, Vol. 2(4), pp.217-227. Şükrüoğlu, D. and Nalin, H.T. (2014) The Macroeconomic Determinants of Stock Market Development in Selected European Countries: Dynamic Panel Data Analysis, International Journal of Economics and Finance; Vol. 6, No. 3, pp.64-71. Tripathy, N., (2011) Causal Relationship between Macro Economic Indicators and Stock Market in India, Asian Journal of Finance & Accounting, Vol. 3, No. 1: E13, pp.208-226. Vazakidis, A. and Adamopoulos, A. (2009) Stock Market Development and Economic Growth, American Journal of Applied Sciences, Volume 6, Issue 11, pp.1932-1940. Yartey, A.C. (2010) The Institutional And Macroeconomic Determinants Of Stock Market Development In Emerging Economies, Applied Financial Economics, Volume 20, Issue 21, pp. 1615-1625.